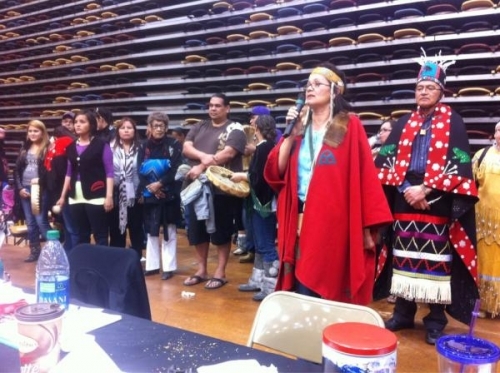 1:16 PST: At the Enbridge shareholder meeting, there was a motion to get the company to report back on legal risks based on First Nations opposition. The motion by Ethical Funds was to push Enbridge to address the risks (such as a possible court battle, delays from protests or blockades and damage to Enbridge's reputation) regarding First Nations’ opposition the Northern Gateway pipeline. The motion got 28 per cent of votes, with 60 per cent voting against. "28 per cent is a spectacular indicator that the shareholders are losing faith in the decisions of their chairman and board," said Canadian Indigineous Tar Sands Organizer Clayton Thomas Muller. Enbridge CEO Pat Daniel admitted the YDA presence last year phased him. Daniel said that Enbridge doens't want to force the project through, but refused to speculate when pushed on whether he would cancel their project if First Nations consent isn't obtained. 1:12 PST: Chief Martin Louie comes out. He says Enbridge plans to push forward with the pipeline. 11:57: Only four out of nine First Nations chiefs allowed in to shareholders meeting. I caught up with Chief Tsohdih. He was, along with many others, denied entry to the shareholder meeting. He personally asked an Enbridge executive why they never responded to his Nation's questions.